How to dress up leggings: Leggings aren’t just for days you don’t want to leave the house or sofa. You can dress up leggings in a matter of minutes with a few simple tricks. Last week, I ordered some leggings from Amazon on a whim. I’ve been living in jeans this fall and I wanted to mix things up a bit. Plus, with all of the traveling we do, I needed some outfits that were more comfortable for the car and sightseeing. Little did I know just how much I would fall in love with these seamless leggings! I’ve been creating outfits like crazy and basically living in them. I ordered these, which came in a three pack. Some of the reviewers said that the leggings pill after washing. So I’ve been hand washing mine using this highly recommended detergent. It’s ideal for lingerie, as well as items labeled ‘dry clean’ only. I’ve always wanted to ignore the ‘dry clean’ only labels but was a little terrified of what I’d do to the fabric. 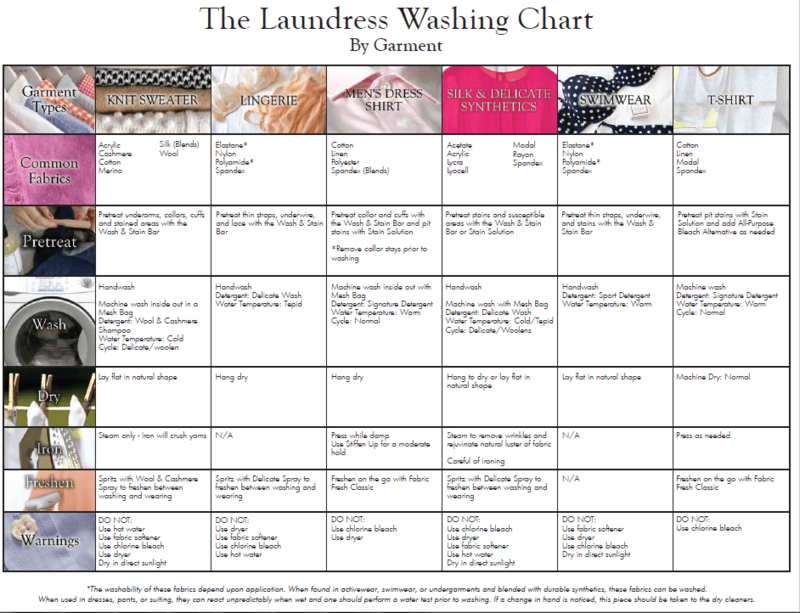 But, a couple of capfuls of The Laundress Delicate Wash for handwashing and I have clean clothes that are well-taken care of. 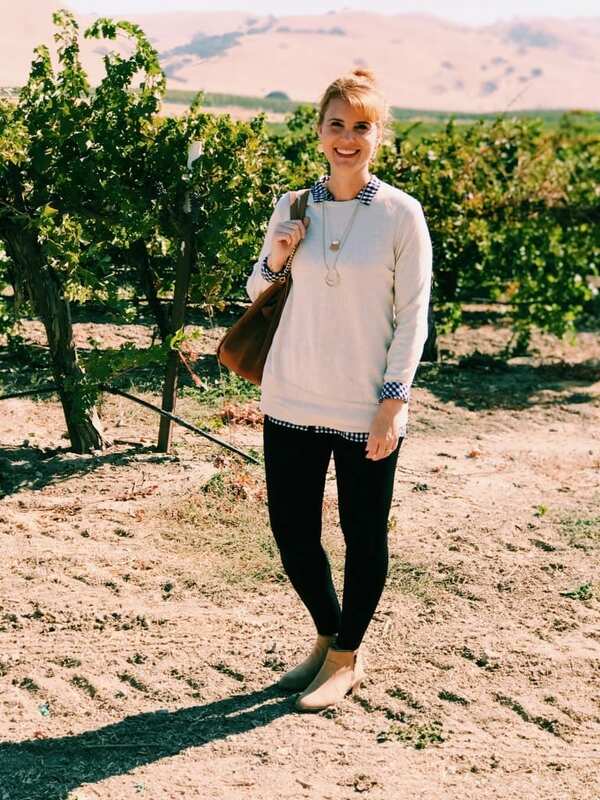 Last week I shared this casual leggings outfit, as well as rounded up some of the best tunic tops to wear with leggings. I also answered the common question ‘Can you wear leggings if you’re over 40?‘ You can see what I had to say about that here. Hide your booty — no ifs, ands or butts about it! Never ever buy, wear or borrow tan- or skin-colored leggings! Good etiquette to follow, don’t you think? Dressing up leggings is pretty easy. In fact, the casual leggings outfit I shared could easily be dressed up by changing my footwear for ankle boots and swapping out the utility jacket for a cardigan or dressy vest. 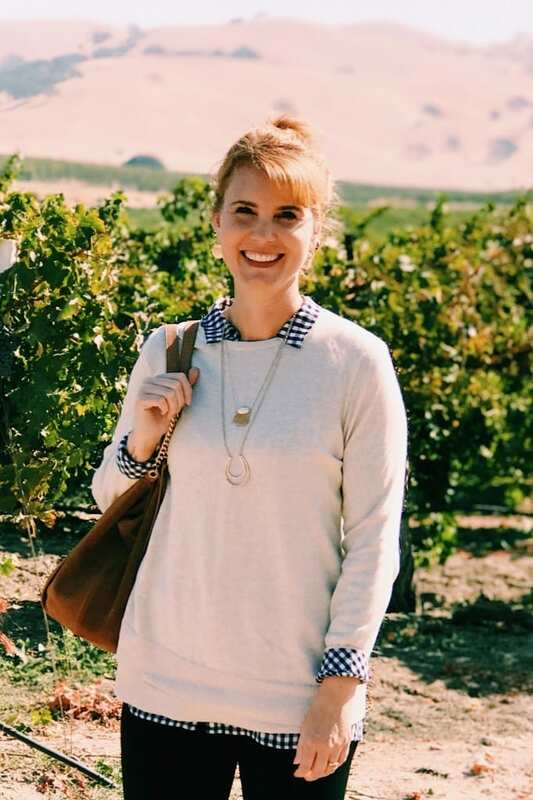 For this outfit, I grabbed two of my J. Jill favorites: the Layered-Hem Pullover in Oatmeal Heather and button-down Gingham shirt (similar one here). Layering is essential for fall since the temperature tends to be a little erratic. 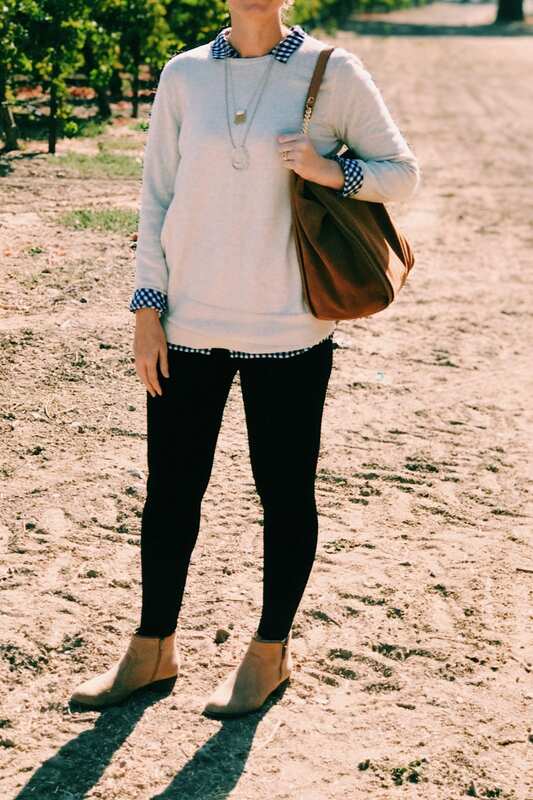 By noon I had already pulled off the sweater and was wearing only the gingham top. Don’t forget your favorite jewelry pieces! 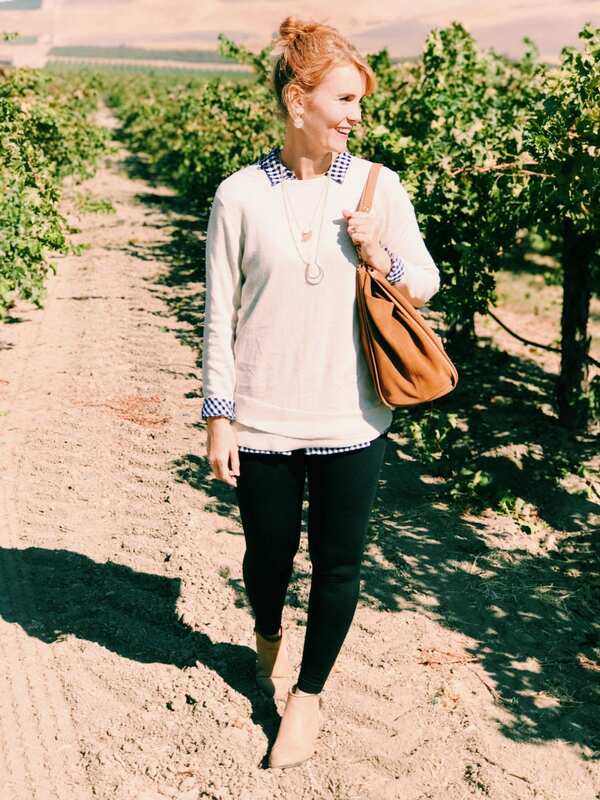 For more fall outfit ideas, be sure to follow my Fall Fashion Pinterest board. You’ll find inspiration from how to dress up your leggings and fall basics to how to style a poncho and more!